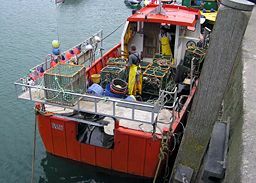 A lobster boat unloading its catch in Ilfracombe harbor, North Devon, England. A fishery (plural: fisheries) is an organized effort (industry, occupation) by humans to catch and/or process, normally for sale, fish, shellfish, or other aquatic organisms. The activity of catching the aquatic species is called fishing, and it is employed in the business of a fishery. Generally, a fishery exists for the purpose of providing human food, although other aims are possible, such as sport or recreational fishing), obtaining ornamental fish, or producing fish products such as fish oil. Industrial fisheries are fisheries where the catch is not intended for direct human consumption (Castro and Huber 2003). The focus of a fishery may be fish, but the definition is expanded to include shellfish (aquatic invertebrates such as mollusks, crustaceans, and echinoderms), cephalopods (mollusks, but sometimes not included in the definition of shellfish), and even amphibians (frogs), reptiles (turtles), and marine mammals (seals and whales, although "whaling" is the term usually used instead of fishing). Among common mollusks that are the target of a fishery are clams, mussels, oysters, and scallops, and such edible cephalopods as squid, octopus, and cuttlefish. Popular crustaceans are shrimp, prawns, lobsters, crabs, and crayfish, and representative echinoderms, which are popular in Asia, are sea cucumbers and sea urchins. Fisheries offer human beings the ability to utilize natural resources of the ocean and freshwater for human prosperity. However, people have created such efficient fishing technologies that people can now exploit nature to a capacity where the targeted species are endangered. Indeed, the history of human interactions with nature has often been one of exploitation for short-term gain, or with little regard for the impact on the animals exploited. As stewards of creation, human beings have the responsibility to regulate their harvesting of aquatic organisms to sustainable levels, where the prosperity of future human generations can be assured, including the aesthetic and non-commercial values offered by the species. The fishing effort is generally centered on either a particular ecoregion or a particular species or type of fish or aquatic animal, and usually fisheries are differentiated by both criteria. Examples would be the salmon fishery of Alaska, the cod fishery off the Lofoten islands, or the tuna fishery of the Eastern Pacific. Most fisheries are marine, rather than freshwater; most marine fisheries are based near the coast. This is not only because harvesting from relatively shallow waters is easier than in the open ocean, but also because fish are much more abundant near the coastal shelf, due to coastal upwelling and the abundance of nutrients available there. Fisheries have been important in various national economies throughout history, including the ancient Phoenicians, Greeks, and Egyptians. Spanish fisheries helped to provide food for the Roman Empire. One of the world’s longest lasting trade histories is the trade of dry cod from the Lofoten area to the southern parts of Europe, Italy, Spain and Portugal. The trade in cod, which started during the Viking period or before, has been going on for more than 1000 years and is still important. In India, the Pandyas, a classical Dravidian Tamil kingdom, were known for the pearl fishery as early as the first century B.C.E. Their seaport Tuticorin was known for deep sea pearl fishing. The paravas, a Tamil caste centered in Tuticorin, developed a rich community because of their pearl trade, navigation knowledge and fisheries. Fishing boat deck with white hake, 1936. Today, fisheries are estimated to provide 16 percent of the world population's protein, and that figure is considerably elevated in some developing nations and in regions that depend heavily on the sea. According to the Food and Agriculture Organization (FAO) of the United Nations, total world capture fisheries production in 2000 was 86 million tons (FAO 2002). The top producing countries were, in order, the People's Republic of China (excluding Hong Kong and Taiwan), Peru, Japan, the United States, Chile, Indonesia, Russia, India, Thailand, Norway and Iceland. Those countries accounted for more than half of the world's production; China alone accounted for a third of the world's production. Of that production, over 90 percent was marine and less than ten percent was inland. There are large and important fisheries worldwide for various species of fish, mollusks and crustaceans. However, a very small number of species support the majority of the world’s fisheries. Some of these species are herring, cod, anchovy, tuna, flounder, mullet, squid, shrimp, salmon, crab, lobster, oyster and scallops. All except these last four provided a worldwide catch of well over a million metric tons in 1999, with herring and sardines together providing a catch of over 22 million metric tons in 1999. Many other species as well are fished in smaller numbers. For communities, fisheries provide not only a source of food and work but also a community and cultural identity. This shows up in art, literature, and traditions. A fishery can consist of one man with a small boat hand-casting nets, to a huge fleet of trawlers processing tons of fish per day. 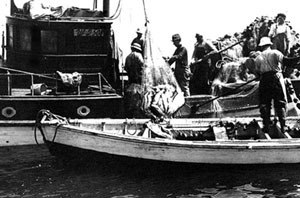 Some techniques are trawling, seining, driftnetting, handlining, longlining, gillnetting, dragger, tile, and diving. Fisheries scientists sorting a catch of small fish and langoustine. Fisheries science is the academic discipline of managing and understanding fisheries. 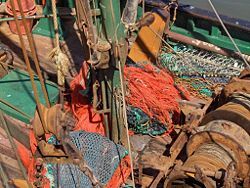 It draws on the disciplines of biology, ecology, oceanography, economics and management to attempt to provide an integrated picture of fisheries. It is typically taught in a university setting, and can be the focus of an undergraduate, master's or Ph.D. program. In some cases new disciplines have emerged, as in the case of bioeconomics. A few universities also offer fully integrated programs in fisheries science. There are many environmental issues surrounding fishing. These can be classed into issues that involve the availability of fish to be caught, such as overfishing, sustainable fisheries, and fisheries management; and issues surrounding the impact of fishing on the environment, such as by-catch (accidental catching of aquatic organisms other than the targeted species or juvenile members of the intended species). There is an apparent and growing disparity between the availability of fish to be caught and humanity’s desire to catch them, a problem that is exacerbated by the rapidly growing world population. As with some other environmental issues, often the people engaged in the activity of fishing—the fishermen—and the scientists who study fisheries science, who are often acting as fishery managers, are in conflict with each other, as the dictates of economics mean that fishers have to keep fishing for their livelihood, but the dictates of sustainable science mean that some fisheries must close or be reduced to protect the health of the population of the fish themselves. It is starting to be realized, however, that these two camps must work together to ensure fishery health through the twenty-first century and beyond. The status of the world's fishery resources remains very much uncertain. The cover story of the May 15, 2003 issue of the science journal Nature—with Dr. Ransom A. Myers, an internationally prominent fisheries biologist (Dalhousie University, Halifax, Canada) as the lead author—was devoted to a summary of the scientific information (Myers and Worm 2003). 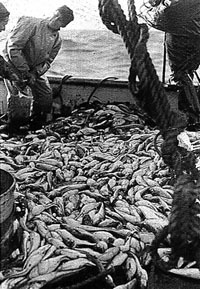 Myers and Worm (2003) assert that "industrialized fisheries typically reduced community biomass by 80 percent during the first 15 years of exploitation" and that "large predatory fish biomass today is only about ten percent of pre-industry levels." These large ocean fish are species at the top of the food chains (e.g., tuna, cod, among others). However, this article was subsequently criticized as being fundamentally flawed, at least in the case of tuna fisheries, and in particular tropical tuna fisheries (Walters 2003; Hampton et al. 2005; Maunder et al. 2006; Siebert et al. 2006). In mid-October 2006, U.S. President George W. Bush joined other world leaders calling for a moratorium on deep-sea trawling, a practice shown to often have harmful effects on sea habitat, hence on fish populations. The journal Science published a four-year study in November 2006, in which the authors conclude that loss of marine biodiversity is increasingly impairing the capacity of the coeans to provide food, recover from perturbations, and maintain water quality (Worm et al. 2006). The authors predict that, at prevailing trends, the world would run out of wild-caught seafood in 2048 (Worm et al. 2006). The scientists stated that the decline was a result of overfishing, pollution and other environmental factors that were reducing the population of fisheries at the same time as their ecosystems were being degraded. Yet again the analysis has met criticism as being fundamentally flawed, and many fishery management officials, industry representatives and scientists challenge the findings. Siebert et al. (2006) conclude that the current biomass ranges from 36 percent to 91 percent of the biomass predicted in the absence of fishing, which is consistent or higher than standard fisheries management targets. The debate continues. Even Worm et al. (2006) predict that the trends of accelerating declines are reversible, and note that many countries, such as Tonga, the United States and New Zealand, and international management bodies have taken steps to appropriately manage marine resources (Worm et al. 2006). Castro, P., and M. Huber. 2003. Marine biology, 4th ed. Boston: McGraw Hill. ISBN 0070294216. Eilperin, J. 2006. Seafood population depleted by 2048, study finds The Washington Post November 3, 2006. Retrieved February 15, 2008. FAO Fisheries Department. 2002. The State of World Fisheries and Aquaculture. Rome: Food and Agriculture Organization of the United Nations. Hampton, J., J. R. Sibert, P. Kleiber, M. N. Maunder, and S. J. Harley. 2005. Decline of Pacific tuna populations exaggerated? Nature 434: E1. Maunder, M. N., J. R. Sibert, A. Fonteneau, J. Hampton, P. Kleiber, and S. Harley. 2006. Interpreting catch-per-unit-of-effort data to asses the status of individual stocks and communities. ICES Journal of Marine Science 63: 1373-1385. Myers, R., and B. Worm. 2003. Rapid worldwide depletion of predatory fish communities. Nature 423: 280. Polacheck, T. 2006. Tuna longline catch rates in the Indian Ocean: Did industrial fishing result in a 90% rapid decline in the abundance of large predatory species? Marine Policy 30: 470-482. Sibert, J. J. Hampton, P. Kleiber, and M. Maunder. 2006. Biomass, size, and trophic status of top predators in the Pacific Ocean. Science 314(5806): 1773-1776. Walters, C. J. 2003. Folly and fantasy in the analysis of spatial catch rate data. Canadian Journal of Fisheries and Aquatic Sciences 60: 1433-1436. Worm, B., E. B. Barbier, N. Beaumont, J. E. Duffy, C. Folke, B. S. Halpern, J. B. C. Jackson, H. K. Lotze, F. Micheli, S. R. Palumbi, E. Sala, K. A. Selkoe, J. J. Stachowicz, and R. Watson. 2006. Impacts of biodiversity loss on ocean ecosystem services. Science 314: 787-790. This page was last modified on 11 April 2017, at 23:27.